UNLEASH THE ARCHERS Stream Track "Ten Thousand Against One"
Vancouver, Canada metallers UNLEASH THE ARCHERS currently out on the road in North America in support of their latest album Apex, that was released in summer of 2017 via Napalm Records. The tour stops tonight in Phoenix, AZ and runs through October 14th in Vancouver, BC. A complete list of dates can be found below. Today the band is excited to share their new lyric video for the song "Ten Thousand Against One", taken from Apex. Watch the video below. Hopefully it gets everyone as stoked for this current North American tour as we are! It's a big one, so this is a shout-out to all of our fans out there: find a show near you and come hang out with us!!! 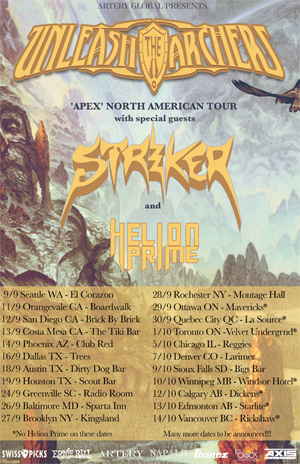 We're bringing STRIKER and HELION PRIME along for the ride, so it's going to be one heck of a PARTY ;) See you all soon," says frontwoman Brittney Slayes. With the release of their fourth album Apex, UNLEASH THE ARCHERS celebrated their tenth year together and unleashed an exhilarating masterpiece that takes you on a furious adventure, weaving through elements of the strongest metal genres of our time. Buy tickets and VIP Upgrades for the tour HERE.